Turmeric: Is There A Big Pharma-Media Conspiracy Against This Herb? Everywhere you go, turmeric is there. It’s in your food, fused into your latte or tea, part of your skin-healing facemask. And some people even juice the stuff! What’s more, doctors are treating everything from Alzheimer’s disease to cancer with it. Whether used whole or in supplement form, there is seemingly nothing it can’t do. Turmeric, also known as Curcuma longa, is the Swiss army knife of the herb kingdom. This legendary spice has been used in Chinese and Indian folk medicine for over 5,000 years. Is Turmeric as Effective as Conventional Drugs? Turmeric is such an icon in the culinary and natural medicinal worlds that it often reminds me of a superhero. Today, 10,000-plus studies reference the powerful effects of turmeric and curcumin (its most active ingredient) in the treatment or prevention of several horrific diseases. A growing number of researchers have even concluded that this spice compares favorably with various conventional drugs, including antidepressants, anti-inflammatories, and even chemotherapy drugs. Turmeric and the powerful polyphenol curcumin have been fighting crime (I mean disease) for millennia with much success. At the same time, the super villain Big Pharma (aka the pharmaceutical industry) will do whatever it takes to stand in its way. After all, nothing bothers Big Pharma more than natural, side effect-free solutions that work as well as or better than the pharmaceutical drugs they offer. Media Attacks Turmeric, but Should You Believe Them? The mainstream media appears to be the ally of drug companies. Exaggerated, embellished, and possibly fabricated headlines regularly make bad guys out of natural remedies that evidence suggests protect and heal us. Where is all this coming from? The basis for this attack stems from a paper published in the Journal of Medicinal Chemistry in January. The perspective review stated that no double-blind, placebo-controlled, human trials (randomized control trials; RCTs) of curcumin have been successful. As a result, news outlets reported that curcumin doesn’t do anything for your health at all. That’s an over-simplistic conclusion to come to. You see, the media and some scientists will ignore anything that isn’t a RCT. In other words, the first-hand experiences of success using turmeric are deemed as “anecdotal claims.” And thought of as completely worthless. Also discarded are the thousands of animal (in vivo) and cell (in vitro) studies that illustrate the therapeutic properties of turmeric and curcumin. The basis for such ignorance is seemingly political, since researchers cannot prove that turmeric, or specifically curcumin, is useful as a drug. Conventional drug development studies run clinical tests on particular compounds, like curcumin. Chemists will favor a reductionist approach with chemicals—and how they interact with the body—while overlooking the fact that herbs have other properties. The problem with this is that when you isolate a single constituent from a herb or whole food, it behaves more like a chemical and less like a natural food. Basically, extracting curcumin changes the functional properties of turmeric. Therefore, it is unfair to say that, since you have not found the healing powers of curcumin (in certain studies), the healing power of turmeric doesn’t exist. This is a flaw within medicinal chemistry, where the object of the study no longer is seen as a living thing. Overall, turmeric is much more than curcumin. Its hundreds of components all must work together to benefit a person’s health. While Big Pharma wants to create synthetic curcumin analogs that can be patented, bad curcumin research fails to show positive results experienced by traditional cultures that use natural turmeric. And, although the media didn’t mention this part, the researchers suggested that future studies take a more holistic approach into account for its chemically diverse elements. They may synergistically add to its potential health benefits. So, as turmeric gains popularity, the media will continue to discourage you from it. Should one study with an agenda negate the thousands of positive studies that support the beneficial power of this remarkable spice? Ji, S., “Forbes Leads Media Attack Against Turmeric Health Benefits,” GreenMedInfo, February 2, 2017; http://www.greenmedinfo.com/blog/forbes-leads-media-attack-against-turmerics-health-benefits, last accessed July 13, 2017. Ji, S., “800 Reasons Turmeric Threatens Big Pharma,” GreenMedInfo, July 4, 2016; http://www.greenmedinfo.com/blog/800-reasons-turmeric-threatens-big-pharma, last accessed July 13, 2017. Lemonick, S., “Everybody Needs To Stop With This Turmeric Molecule,” Forbes, January 19, 2017;https://www.forbes.com/sites/samlemonick/2017/01/19/everybody-needs-to-quit-it-with-this-turmeric-molecule/#47a97b9a79ff, last accessed July 13, 2017. “Contrary to decades of hype, curcumin alone is unlikely to boost health,” ACS, January 11, 2017;https://www.acs.org/content/acs/en/pressroom/presspacs/2017/acs-presspac-january-11-2017/contrary-to-decades-of-hype-curcumin-alone-is-unlikely-to-boost-health.html, last accessed July 13, 2017. Rathi, A., “Forget what you’ve heard: Turmeric seems to have zero medicinal properties,” QUARTZ, January 12, 2017; https://qz.com/883829/a-large-scientific-review-study-shows-that-curcumin-in-turmeric-has-no-medicinal-properties/, last accessed July 13, 2017. MacMillan, A., “Turmeric May Not Be a Miracle Spice After All,” TIME, January 12, 2017; http://time.com/4633558/turmeric-curcumin-inflammation-spice/, last accessed July 13, 2017. Ji, S., “Science Confirms Turmeric As Effective As 14 Drugs,” GreenMedInfo, May 13, 2013; http://www.greenmedinfo.com/blog/science-confirms-turmeric-effective-14-drugs, last accessed July 13, 2017. A woman who battled blood cancer for years with out success finally halted the disease with turmeric, it has been reported. Dieneke Ferguson is now living a normal life after giving up on grueling treatments that failed to stop it. 21,000 people die each day from cancer. 35,000 people are informed by doctors each day that they have cancer. Far too many people even fear the very word “cancer.”However, it doesn’t need to be this way. Those numbers can be dramatically reduced. The fear can be, too. And they should be.Because — though most people haven’t yet heard of them — today there are many highly effective ways to prevent cancer, and also to beat it if you or a loved one has it or ever gets it.There is great hope. There are real answers. We’re going to share them with you. For free. Be sure to keep an eye out for emails coming from us, The Truth About Cancer (info@thetruthaboutcancer.com) as I will send you up to date information on how to prevent , treat, and beat cancer. Also be sure to follow us on facebook here as we post powerful information there and I don’t want you to miss a single thing. Thanks again for supporting our mission to expose, educate and eradicate cancer. The deep untapped sections of this gold mine - the expert interviews and survivor stories - are rich with essential life-saving information. Full length and uncut, you'll get even more knowledge about cancer. Fiona Underwood* was in trouble, deep trouble. But she tried to stay positive, smiling at us and welcoming us to her charming B&B in Mystic, CT for the weekend. Still, the corners of her mouth turned down even when she smiled. Tears welled in her eyes from time to time. Looking around at the home she'd grown up in, that she'd married in and where she'd raised her own three children, it was probably just too painful. If only she and her husband had known about the dozens of very powerful ways out there to prevent, treat, and even beat cancer. But she hadn't heard of them. And you probably haven't either. Fiona's romantic colonial house is sold now. It's been torn down to build a McMansion. There was a beautiful old oak tree that shaded Fiona and her husband when they exchanged vows in the backyard years ago. It's gone too. It's true that the Silver Package of "The Truth About Cancer: A Global Quest" offers tons of proven alternative methods to prevent, treat, and even beat cancer. Ones you can benefit from right now. But like a gold mine, drilling down can open up huge seams of wealth. And those additional seams of golden information are in the "The Truth About Cancer: A Global Quest" Gold Package. Hello, I'm Ty Bollinger. I wish I'd had this information myself years ago. That's when I lost not only my mother and father, but also both grandfathers, my grandmother, an uncle, and a cousin to cancer and conventional cancer-related treatments in only 7 years. I was devastated. I felt helpless. My wife, Charlene, was my hope and my faith during this terrible time, helping me get through each day. But even she couldn't cure me of my anger and grief. But then, with the help of prayer and the support of my family, I found the answer. I channeled all of those feelings and energy into starting the search for the truth about cancer. I knew there had to be more than the false promises and barbaric treatments available through conventional medicine. Expose the misinformation out there about cancer prevention and treatment. "The Truth About Cancer: A Global Quest" is the pinnacle of that mission. Traveling around the world to bring you answers, this 9-episode docu-series was a labor of love. The 9-episode docu-series, "The Truth About Cancer: A Global Quest" brings together all of the little-known prevention and treatment methods for cancer from around the world. With over 100 experts (doctors, scientists, researchers) offering their expertise, you can get access now to the answers you and your loved ones need to prevent, treat, heal from, and even beat cancer. Digging down and getting to the heart of the truth about cancer, Episode 2: Cancer Facts and Fictions, Breast Cancer, Hormones, Skin Cancer & Essential Oils will challenge many things you've believed about cancer up until now. Things you thought would protect you, but actually cause cancer to develop! Learn in Episode 4 why reading labels won't necessarily protect you from this sneakily-renamed toxin found in many foods in your grocery store and probably in your home. Described by experts as "fertilizer" for cancer growth, this is something you need to know how to avoid, stat! Find out "the most useful plant on Earth" in Episode 8 and how it kills cancer cells. In scientific research conducted by Harvard University, this superplant decreased lung cancer by 50%. Beat Cancer - If you've been told by your doctor that there's nothing more they can do, you know how devastating that is to hear. But there's hope! There are countless scientifically proven ways to beat "hopeless" cases of cancer provided by "The Truth About Cancer: A Global Quest". To top it off, most of the Cancer Conquerors featured in the docu-series were also told that there was no chance of survival - yet, using alternative methods, they're alive and well 5, 10, 30, and even more years later! Over 100 experts from around the world were consulted and interviewed to bring you "The Truth About Cancer: A Global Quest". These experts included doctors, scientists, researchers and investigative journalists. 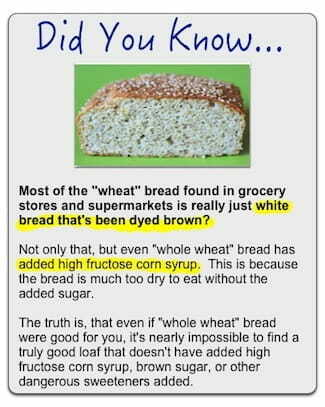 Most people DON'T understand the reasons... and the fact is that some of the foods I listed in the article title above can not only DESTROY your hormones and metabolism, but may also CAUSE you to get heart disease, type 2 diabetes, Alzheimers, and even cancer. Although vegetable oil has a healthy sounding name, it's NOT made from vegetables...As you might already know, vegetable oil actually comes from any combination of corn oil, soybean oil, canola oil, safflower oil, and/or cottonseed oil, ALL of which are absolutely terrible for your health. You already KNOW that trans fats are deadly, so I won't go into all of the science as to why trans fats kill you and DAMAGE your cell membranes in your body...leading to all sorts of scary health problems like cancer, obesity, Alzheimer's, heart disease, and more. Knowing these facts, I'm sure you already know to stay away from foods that contain partially hydrogenated vegetable oils. You've heard that a million times before. However, what you probably DON'T know is that even non-hydrogenated vegetable oils (all vegetable oils are refined) also contain some trans fats due to the extremely high heat, solvents, and pressure they are exposed to during the refining process. And yes, this includes so-called "expeller pressed" vegetable oils as well. All of this high heat and high pressure processing along with the use of hexane solvents actually forces some of the polyunsaturated content of vegetable oils (yes, even so-called "healthy" canola oil) to be transformed into trans fats and something even worse that we'll talk about in a minute called "MegaTrans". 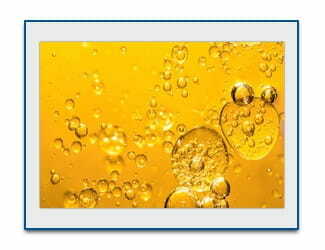 All vegetable oils contain oxidized fats due to the refining process and chemical reactions with the polyunsaturated fat content of vegetable oils. 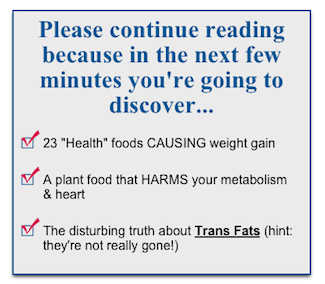 Expert Nutrition author, Catherine Shanahan, MD, calls the fats in vegetable oils "MegaTrans", because they are similar in chemistry to trans fats, but even WORSE. Free radicals formed during the refining of vegetable oils create these "mutant" fats, which damage your cell membranes & chromosomes, and create massive inflammation in your body. The free radicals in vegetable oils also damage your arteries, which can directly lead to a heart attack. Please be aware that this isn't just a long-term risk of eating vegetable oils daily. 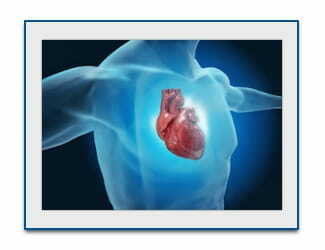 There are also studies that show immediate dysfunction in your arteries, also called endothelial function. If you think I'm exaggerating, think again... Dr Shanahan also surveyed hundreds of patients that were admitted to the hospital for a heart attack, and discovered that every single patient that just had a heart attack had consumed foods made with vegetable oils with their last meal before the heart attack...Scary huh! Think about THAT next time you order the fries with that sandwich on the menu! It really is THAT serious. Always ask to replace french fries that come with most meals with side veggies, fruit, or a salad instead. That may very well be the difference between dying tomorrow or enjoying many more years on this beautiful planet. One of the other MAJOR reasons that vegetable oils are killing you is they are mostly made up of inflammatory omega-6 fats, while having very little anti-inflammatory omega-3 fats. 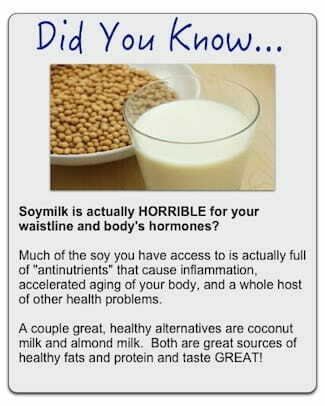 And worse yet, these omega-6 fats are NOT the innocent type found in nuts, they are the "mutant" damaged MegaTrans type that harm the tissues of your body. 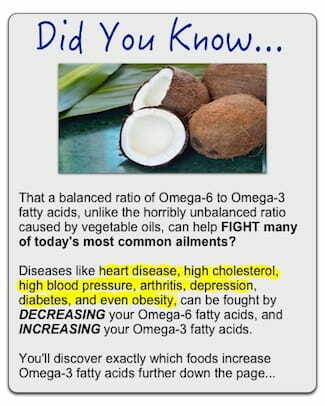 This Omega fat imbalance can be YET another reason why vegetable oils lead to heart disease, cancer, obesity, and many other degenerative diseases that WILL shorten your life significantly if you don't cut out the vegetable oils ASAP. As a quick note, the solution to all of these major problems with vegetable oils is to use healthy oils like coconut oil, olive oil, macadamia oil, avocado oil, and grass-fed butter, all of which are MUCH healthier than vegetable oils and don't cause any of the problems we've described in this section of the article. In fact, most people falsely think that if they eat sugar, they can just exercise a little bit harder that day or the next day so they can "burn it off"... Unfortunately, that kind of thinking will lead you to an early grave. It's not as simple as just "burning off sugar" -- It's about what sugar does internally to the cells of your body, and how sugar gums up your internal workings, causing disease. If you knew exactly why sugar is so bad for you and exactly what it does to your cells in your body, I promise that you would think twice about eating that piece of cake, candy, sugary soft drink, fruit juice, or ice cream, or feeding them to your children. If that weren't bad enough, eating sugar too frequently also causes type 2 diabetes in the long run because you wear out your pancreas and insulin sensitivity. To clarify, when we talk about how much damage sugar does to your body, we're NOT talking about tiny amounts such as having 5 grams of sugar from a teaspoon of honey in your tea... Small amounts of natural sugar like that are not a problem. The REAL damage occurs when you eat that piece of cake and ingest 40-50 grams of sugar in one sitting, or that bag of candy with 35+ grams of sugar, or that soft drink with 45 grams of sugar or more... Or even that so-called "healthy" smoothie at the local smoothie shop that contains a whopping 80 grams of sugar because of all of the fruit syrups they use in them. Now that you know why sugar, wheat, and vegetable oils are killing you and your family, maybe you'll think twice about eating cereals, breads, bagels, muffins, candy, and processed foods or fried foods from restaurants that are cooked in vegetable oil. Almost every time, I see their kitchen cabinets and fridge LOADED with foods that they think are "healthy" (or have been deceived by clever food labels into believing are healthy), but in reality are fat-storing traps in disguise. 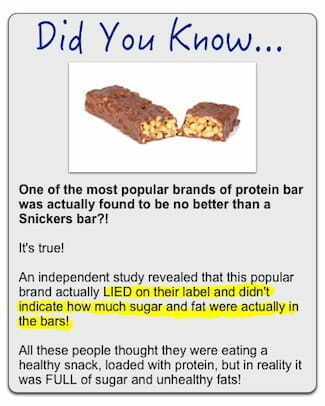 I see this trend over and over again with almost every client when I first inspect their cabinets and the foods that they were buying that they thought were healthy. What they don't realize is that it's these exact foods that are sabotaging their fat loss efforts, increasing their cravings, throwing their hormones out of whack, and CAUSING terrible diseases like Diabetes, Heart Disease, and Cancer. There are two ingredients that are always found in my household. They are known to offer a range of therapeutic properties and taste delicious in a wide selection of recipes. Often being two key ingredients in one of my favorite homemade vinaigrettes, there’s no denying the beneficial use of both apple cider vinegar and raw honey. Perfectly balancing one another in terms of acidity and sweetness, these two health-promoting ingredients will help you flush toxins, promoting optimal positive health. Whip up this tonic yourself, adding it to your current daily health regimen. Work with your body and it will help you ward off diseases and essentially improve your quality of life long-term. Tonics come in many shapes and forms, utilizing a wide range of ingredients and remedies. Put simply, a tonic is any medicinal substance that can be taken in order to restore vigor and overall well-being. If you feel rather sluggish, you may be in need of a good ol’ fashion cleanse — ridding your body of toxins and waste. When you are experiencing a blocked colon, toxicity will generally follow. This creates a combination of symptoms that you may be experiencing this very moment. Of course, constipation is often a key sign, as well as increased acne, fatigue, aches and even bad body odor. To cleanse your colon, welcome an effective, gentle and easy-to-take drinkable remedy into your routine. Working with your body, the use of an apple cider vinegar and raw honey cleanse will simply purify your system, allowing you to naturally flush out waste. As your body retains more “good” bacteria, your digestive and immune system will benefit. Apple cider vinegar (which is essentially fermented apples) and raw honey both offer probiotics. It’s been found that when consuming probiotic-rich foods, you’re able to detoxify accumulated heavy metals, according to a 2015 study published in the journal of the Applied and Environmental Microbiology. It’s also been found that when studied in mice, as well as in human intestinal cells, the oral administration of certain probiotics is able to reduce the uptake of the heavy metal cadmium. This heavy metal is known to cause inflammation of the intestine and damages to the gut barrier. 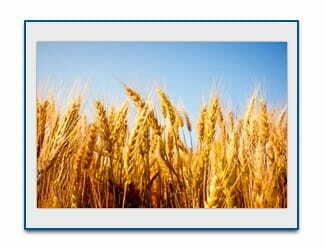 As barrier cells are killed, permeability and absorption into the body increase. Both raw honey and vinegar have a vast history — often viewed as traditional remedies for just about everything. Like any ingredient, it’s important to source the most beneficial option. When it comes to apple cider vinegar, you should only consume unpasteurized, organic apple cider vinegar that contains the mother. Often looking as though the vinegar has congealed, you will notice little floating pieces within the vinegar — don’t let this put you off. It is the “mother” that provides your body with key enzymes and beneficial bacteria. In turn, you’re able to improve both gut and colon function. Based on the active components in apple cider vinegar, including acetic acid, catechin and gallic acid, these bioactive compounds are known to offer antioxidant, antimicrobial and anticancer benefits, all while reducing your risk of obesity, hypertension, high cholesterol, diabetes and more. Once again, raw honey is a functional food with a unique composition. For years, it has been well understood that raw honey can help to overcome cardiovascular, liver and gastrointestinal issues. Containing more than 180 substances, this sweet treat contains amino acids, minerals, vitamins and active enzymes. Within one study published in BMC Complementary and Alternative Medicine, researchers concluded that raw honey offers protective effects which are dependent on its antimicrobial and probiotic properties. As colonic probiotic bacteria increases, several benefits follow, including detoxification and antigenotoxicity — reducing your risk of genetic mutations and overall disease. As you can imagine, when you combine these two key ingredients, you’re left with the ultimate colon cleanser that supports your overall immune system. Change your diet and you’ll change your life. In order to get into a set routine, take this tonic at the same time each morning, afternoon, or evening — whatever best suits you. No need to worry about being by a bathroom. As mentioned, although this remedy is fast-acting in that it will be rapidly absorbed and utilized by the body, you will not need to worry about problematic bowel movements throughout the day. It will, however, quickly begin working with your digestive system to improve functioning. LONGEVITY: Tea made with honey and cinnamon powder, when taken regularly, arrests the ravages of old age. Use four teaspoons of honey, one teaspoon of cinnamon powder, and three cups of boiling water to make a tea. Drink 1/4 cup, three to four times a day. It keeps the skin fresh and soft and arrests old age. WEIGHT LOSS aily in the morning one half hour before breakfast and on an empty stomach, and at night before sleeping, drink honey and cinnamon powder boiled in one cup of water. 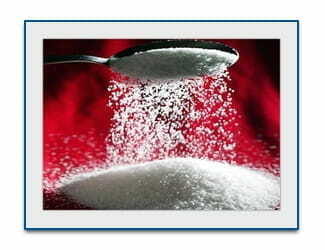 When taken regularly, it reduces the weight of even the most obese person. Also, drinking this mixture regularly does not allow the fat to accumulate in the body even though the person may eat a high calorie diet. Until next week...keep on believing. In Susan Duclos' story yesterday on ANP called "EMP Attack On America - Preppers Vs Non-Preppers In The First 72 Hours - Who Will Live, Who Will Die," we saw 'preppers' live while 'preppies' died. Being prepared vs unprepared made the difference between life and death within 72 hours and as we can see by the amazing videos below coming out of Venezuela, a trip to the supermarket during an EMP or economic collapse could quickly turn into sheer horror or a 'life or death experience' as neighbor fights against neighbor to get what they all should have gotten long ago. If you think that what we're seeing in the videos below couldn't happen in America, you simply need to remember what happened in October of 2013 as EBT systems across the country went down and local stores quickly turned into mad houses with looting and chaos. If you think your last visit to Wal-Mart was bad, you haven't seen anything yet. Despite the fact that many Americans are still 'asleep at the wheel' or dependent completely upon the government when it comes to being prepared, they'll have to awaken quickly as we take a look below videos at a recent SQAlert in which a farmer in America's heartland warns us that we better get set for 'off the chart' beef prices with the arrival of something "unlike anything America has ever known before." As Daisy Luther at the Organic Prepper recently reported, the government of Venezuela has just forced farmers to hand over their food to the government. Anyone who thinks that couldn't happen here needs to read Barack Obama's numerous executive orders dealing with the nationalizing of resources to realize that the government has been preparing for something huge for a very long time. The starvation policy is apparently a copy of the Holodomor that Stalin executed in Ukraine in the winter of 1932-33 in order to suppress a possible revolt. (https://youtu.be/5Wqso9KEhDE) In the next video below we see a compilation of mainstream news media reports about what is now going on in Venezuela and the world with a warning for still sleeping America - do you even know what's going on? Another compilation of Venezuelen food riots from July of 2015. Anyone think this CAN'T happen here? Associated Press report from Venezuela came out yesterday. Imagine America under the same conditions ...and much worse. Another huge problem in Venezuela...Venezuelan bakers have gone without flour for close to a month and now there is a severe bread shortage nationwide. If America soon loses our world's reserve currency status in the US dollar, is this what may soon be happening here? While the next video below is from December of 2014, it certainly shares an experience of what it's like for human beings who are unable to obtain the most basic food staples. Imagine this in America. GET SET FOR OFF THE CHART BEEF PRICES-COUPLED WITH LACK OF FOOD AVAILABILITY AND PRICING WILL BE SO UNLIKE ANYTHING AMERICA HAS EVER KNOWN BEFORE!